Question: Do BT Headsets with built in Voice Dialing work on Droid? Discussion in 'Android General Discussions' started by 928Droid, Dec 6, 2009. 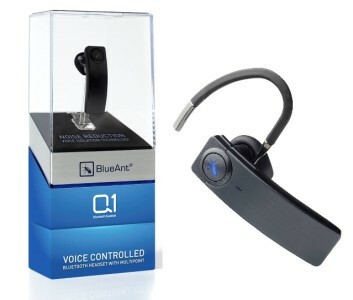 Have a BlueAnt Q1 BT headset on the way to me. It has built in voice dialing and was wondering if any knows if BT headsets with built in voice dialing work(voice dial) on the Droid? If no one knows I will update if it does or not when I get mine. I know it doesn't work natively on the Droid at the moment, I am talking about the BUILT IN voice dialing of some BT head sets. With the Q1 it stores its on set of speed dial numbers accessed by voice command. I found this on the thread you posted from DickB and it is encouraging! "You can do voice activated speed dialing from your DROID but the process must be initiated from and controlled by a device such as the BlueAnt Q1 Bluetooth headset which can be purchased for about $55 on the Internet. The way it works is as follows and it opperates just as if the DROID itself actually supported Speed Dialing. WHICH IT DOESN'T! 1) You have to first receive a call from the phone number which you wish to add to your speed dials. Just call the person and ask that they call you back! 2) After their call is finished you press the control button on the Q1 which will verbally ask you which speed dial to assign the number to. 3) You simply say "speed dial 1 or 2 or 3"! you get the idea! 4) To dial a number in your speed dials you simply press the control button on the headset and then say "speed dial 1 or 2 or 3". It's all controlled by the headset and incidentilly you can also say "check battery" or "check time" and quite a few other commands which can be listed for you by simply saying "what can I say" or "teach me" It's really pretty cool! Other models of BlueAnt headsets also support this function and there may be other manufacturer's units that do as well but I personally use the BlueAnt Q1 which works very well. I have a collection of about 7 or 8 headsets I have tried out but the Q1 seems to work best for me. I have to add that I am very disappointed that my DROID is missing so many features which any self respecting cell phone supports such as repeating missed voice mail and incoming call notifications, speed dialing, the ability to send ringtones to others and turning off the phone lock. Well I hope this helps ease the pain for other DROID owners who want to use speed dialing on thier crippled Motorola phones". He who dies with the most toys wins! Good luck people !" No worries, with all the chatter about no voice dialing on the Driod it is understandable. I got my BlueAnt Q1 on sale for $49 and free shipping, normal retail is around $130 or so. It got the best reviews for noisey enviroments which is how I found it to start with, the built-in voice control and modern styling was icing on the cake. IF the 7% coupon doesn't work then don't forget about the "FREESHIP" coupon code.